Radiator: The purpose of the radiator is to cool down the water received from the engine. Hot water from the upper tank, which comes from the engine, flows downwards through the tubes. The heat contained in the hot water is conducted to the copper fins provided around the tubes. An overflow pipe, connected to the upper1 tank, permits excess water or steam to escape. This is perhaps the oldest type of radiator, although it is still in use. In this, water flows inside the tubes. Each tube has a large number of annular rings or fins pressed firmly over its outside surface. The only difference between a gilled tubes radiator and a tubular one is that in this case there are no separate fins for individual tubes. The radiator vertical tubes pass through thin fine copper sheets which run horizontally. The cellular radiator consists of a large number of individual air cells which are surrounded by water. In this, the clogging of any passage affects only a small part of the cooling surface. However, in the tubular radiator, if one tube becomes clogged, the cooling effect of the entire tube is lost. This is a centrifugal type pump. It is centrally mounted at the front of the cylinder block and is usually driven by means of a belt. The bottom of the radiator is connected to the suction side of the pump. The power is transmitted to the pump spindle from a pulley mounted at the end of the crankshaft. Seals of various designs are incorporated in the pump to prevent loss of coolant from the system. The fan is generally mounted on the water pump pulley, although on some engines it is attached directly to the crankshaft. It serves two purposes in the cooling system of a engine. (i) It draws atmospheric air through the radiator and thus increases the efficiency of the radiator in cooling hot water. 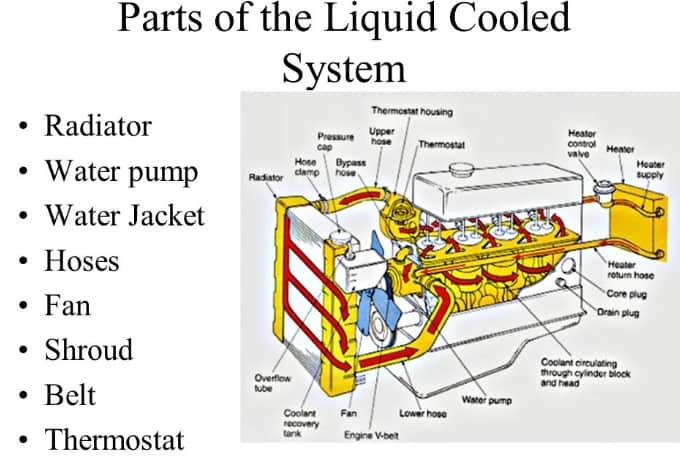 (ii) It throws fresh air over the outer surface of the engine, which takes away the heat conducted by the engine parts and thus increases the efficiency of the entire cooling system. -Because of even cooling of cylinder barrel and head (due to jacketing) makes it possible to reduce the cylinder head and valve seat temperatures. -The volumetric efficiency of water cooled engines is higher than that of air-cooled engines. -Compact design of engines with appreciably smaller frontal area is possible. -In case of water cooled engines, installation is not necessarily at the front of the mobile vehicles, aircraft etc. as the cooling system can be conveniently located. -The system requires more maintenance. -The engine performance becomes sensitive to climatic conditions. -The power absorbed by the pump is considerable and affects the power output of the engine. -In the event of failure of the cooling system serious damage may be caused to the engine.